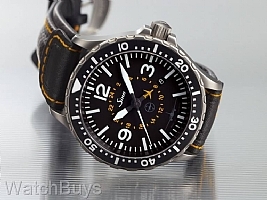 Many of you may remember a watch that Sinn retired some time ago that was built for the official German airline Lufthansa (LH), specifically their Cargo Division. This model has subsequently become quite collectible. Sinn worked with officials at Lufthansa to develop a new limited edition series for the airline, this time an officially certified pilot's watch (compliant with the TESTAF standards). The result of these efforts is the Sinn 857 UTC TESTAF LH Cargo Limited Edition. Lufthansa is the German flag carrier and the largest airline in Europe, and is currently operating the most modern freighter in its class: the aforementioned Boeing 777F. Like the Sinn 144 GMT Lufthansa Cargo before it, the Sinn 857 UTC TESTAF LH Cargo Limited Edition was developed as collaboration between Sinn Spezialuhren and Lufthansa Cargo, as the perfect watch for this high-performance aircraft. Pilots require absolute reliability and utmost precision, and this instrumental watch was tested and certified in accordance with the TESTAF standards, which ensures that it is qualified for professional use as a pilot watch at the highest level. This watch is limited to 777 pieces in celebration of this collaboration, and the dial and UTC hand feature a stylized silhouette of the Boeing 777F. 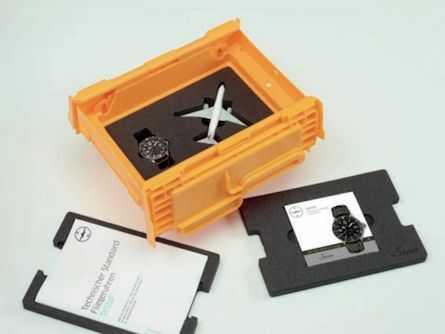 Each watch also features an engraved limited-edition number on the case back along with an elaborate shipping cargo container-styled display box complete with miniature airplane collectible. The case of the Sinn 857 UTC TESTAF LH Cargo Limited Edition in steel has been hardened with Tegiment technology to make it especially scratch-resistant. The range of technologies also includes Sinn's Dry Hold technology for greater functional reliability and freedom from fogging and overall functional reliability at temperatures between 45 C and + 80 C.
The Sinn 857 UTC TESTAF LH Cargo Limited Edition also features a second time zone on a 24-hour basis with a unique hand in the shape of an airplane. "Having tried the rest, is WatchBuys the best?" Verified Owner Comments: Two important factors in buying a watch: the watch itself and the company from which you buy it. The special edition 857 UTC is my first Sinn watch, though I own several flieger style Hanharts and Tutimas that I'm still quite fond of and that provide a frame of reference for these comments. The Sinn 857 just happened to be the right watch at the right place at the right time. From mechanical aspects to looks to that great leather strap it comes with...love at first sight. Watch buying process? I've worked with some very fine watch companies over the years...no disrespect to them intended, but the customer reps at WatchBuys are as good as they come. I worked with several reps as part of the 857 purchase process...they were all efficient and helpful. The website is easy to use, and when WatchBuys says the watch will arrive at a selected time, they and FedEx make sure this happens. I'm hooked. Verified Owner Comments: I have had my first Sinn for about a month. After due diligence including several telephone conversations with WatchBuys, I placed an order sight unseen for the 857. I received it approximately three weeks before the date I was promised. The 857 has been great. I wanted a unique and rugged automatic and my expectations were exceeded. Accuracy has been excellent. Feel and appearance are outstanding. Hoping to acquire another Sinn at some point. A++ overall. "Amazing watch and great service from WatchBuys!" Verified Owner Comments: This is my first Sinn. I called on a Sunday night to ask about Sinn products. I didn't realize that I called after hours (I'm on the west coast). The owner Rob called me back and we spoke for about 30 minutes. After our conversation I ordered this limited edition watch. It was a special order and they kept me updated about the status of my purchase. I was impressed with the customer service. The watch itself it perfect and as described on the Sinn website. I already banged it a few times on a car door, office door frame, window, and mailbox. There are NO signs of wear to date. I am now thinking of getting the fully tegimented U1, which has the same 22mm strap size.